Regional and international experts on sustainable built environments came together at the seventh Annual Emirates Green Building Council (EmiratesGBC) Congress to discuss best practices and immediate strategies to transition to net zero cities within the coming decade to curb the damaging effects of carbon emissions. 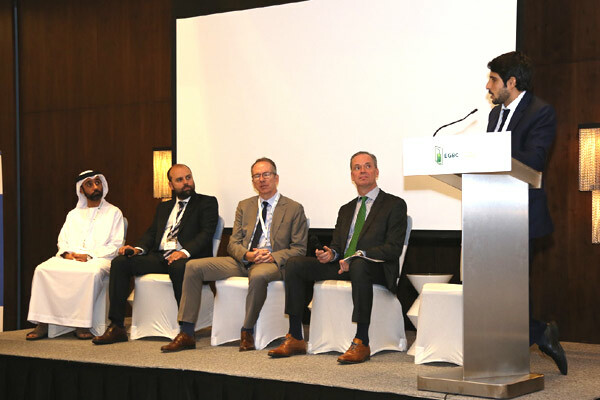 Organised by EmiratesGBC, an independent forum aimed at conserving the environment by strengthening and promoting green building practices, the Congress was held under the theme ‘Targeting Zero: A Vision for Future Cities’in Dubai recently. The congress hosted several regional and international experts who agreed that the world is currently at a point of no return, and that all stakeholders, including the public, have to take bold, immediate steps to avoid the disastrous effects of climate change. Saeed Al Abbar, Chairman of EmiratesGBC gave the welcome address followed by Ahmed Muhairbi, Secretary General, Dubai Supreme Council of Energy; and Engineer Hussain Hassan Khansaheb, Director of Partnerships & Special Projects, Ministry of Climate Change and Environment. The opening session concluded with a video message by Terri Wills, CEO, World Green Building Council, urging industry stakeholders to formally endorse and sign the Net Zero Carbon Buildings Commitment, which is a significant step aimed at generating the next wave of high momentum to cut down global greenhouse gas emissions. In his welcome note, Al Abbar, referenced the most recent report by the Intergovernmental Panel on Climate Change (IPCC) which states that “the planet could pass the 1.5 deg C threshold as early as 2030, which would result in severe consequences to the plant,” if there are no concrete efforts made to tackle the current state of carbon emissions worldwide. "The Congress, this year, is by far the most important one to date as we face the unprecedented challenge of securing a prosperous future for upcoming generations," he stated. "We have a small window of opportunity over the next 12 years, to make a significant change and confidently look to our children and future generations and tell them that we did our best and overcame this challenge. Change is achievable if we start today," noted Al Abbar. "We have come a long way in the past 10 years to get to the level of awareness and commitment we have today on sustainability. I believe that with the ingenuity of human spirit, the great minds we have in our industry and the leadership of the government sector that we can rise to the challenge and deliver on our global net zero emissions targets," he added. The 2018 Congress’ discussions focused on three sub-themes that were closely related to honouring and promoting the values associated with the late Sheikh Zayed bin Sultan Al Nahyan as the UAE marks the Year of Zayed this year to commemorate his 100th birth anniversary. These are: Inspired Cities reflecting the Wisdom of Sheikh Zayed; Collaborative Cities focusing on the value of Respect; and Holistic Cities mirroring the value of Sustainability which caters to the needs of future generations. The speakers presented and discussed strategies for promoting sustainable built environments for the cities of the future within the objectives of the Paris COP21 Climate Agreement. Through compelling presentations and case studies the Congress further highlighted the urgency to influence sustainable practices in the UAE’s built environment and to help identify key industry challenges and solutions as well as catalyse innovation in green building practices to create new models that support the country’s efforts to be more sustainable in accordance with Vision 2021. EmiratesGBC said it aims to further develop the conversation and encourage the increased participation of the industry through its recently established Net Zero Centre of Excellence.